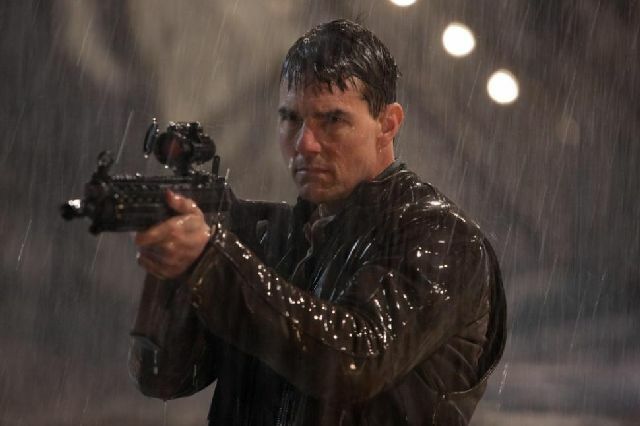 Jack Reacher opens with a visually impressive sequence in which we see a gunman’s point of view of prospective targets on the opposite side of a city river through the sights of his high-powered rifle. The cross-hairs settle on one small figure before moving on to another in a seemingly random pattern before returning to its initial target. It’s a tantalising opening which ombines tension and mystery in equal measure and introduces an expertly constructed — and dialogue-free — sequence in which evidence is collected from the scene and a suspect arrested. That suspect is James Barr (Joseph Sikora), an un-cooperative former army sniper, who instructs his interrogators to get Jack Reacher. Reacher is unknown to the investigating police officers. He’s a drifter, a former military man who served with Barr but is no friend of him. He proves impossible to trace, but as investigating officer Emerson (David Oleyowo) and District Attorney Alex Rodin (Richard Jenkins) discuss just how impossible it is, Reacher strolls into their office. Ta da! That’s a movie moment that would never happen in real life for all manner of reasons, and which typifies this movie’s sometimes tenuous relationship with reality. Reacher is played by Tom Cruise, and he’s very good in a role for which he is an unpopular choice amongst devotees of Lee Childs’ series of thrillers. In Childs’ novels Reacher is an imposing 6’ 5”, while Cruise is a diminutive 5’7”, but he never looks out of place in the part, even when he’s beating up five husky bruisers tasked with discouraging him from pursuing an investigation of the shootings by the real culprits. Barr is represented by public defender Helen Rodin (Rosamund Pike), who coincidentally happens to be the daughter of the aforementioned District Attorney. Reacher is a good man to have on your side when the odds are stacked against you. He possesses the kind of deductive reasoning that would give Sherlock Holmes a run for his money. In fact, Reacher is so good at everything he does, whether it’s fighting bad guys, shooting firearms or driving backwards at speed, that he’s more like Superman than Sherlock. It’s to Cruise’s credit that he’s always believable in the role. He’s starting to look his age these days, and those youthful looks are starting to coarsen, but then he’s been around so long (his first movie, Endless Love, was released in 1981) that it’s hardly surprising the years are starting to catch up with him. He plays Reacher as a fairly dour, humourless man who nevertheless possesses a degree of charisma that attracts people to him. The storyline is perhaps a little more convoluted than it needs to be given the relative simplicity of the plot behind the apparently random killings, a fact that’s reflected in an overlong running time of 130 minutes. But the time never drags, with things chugging along at a fast enough pace to hold the interest of even those with the shortest of attention spans. Jai Courtney plays Reacher’s chief adversary, and although little is revealed about his character, the actor possesses a screen presence that matches Cruise’s and is sure to make a mark in future Hollywood movies. His character’s strings are pulled by a sinister figure named The Zec, played by German director Werner Herzog, whose villainy is perhaps a little cartoonish but effectively creepy nonetheless. Jack Reacher provides solid, quality entertainment for the bulk of its running time, but the final reel is something of an anti-climax after some of the fireworks that precede it. Reacher emerges from the entire adventure with his superhero image intact, and there’s the prospect of many more Reacher adventures to follow, which may or may not be a good thing. While Tom Cruise might not be the screen giant he once was, the quality of the projects he chooses is generally still of a high standard, so if Jack Reacher does become a franchise it could be that it will be one of the better ones.